Just one day shy of 15 years later, the community honoured her by presenting her with a 15-year Yearbook with photos and stories of her long term service. When she began, Ellie had just completed her Health Care Aide diploma and was looking to supplement part-time jobs she had at the time. “I had decided to become a Health Care Aide because I was close with my grandfather,” Ellie says. “I loved the idea of making a positive difference in elders’ lives. At Athens I found I was able to do that." 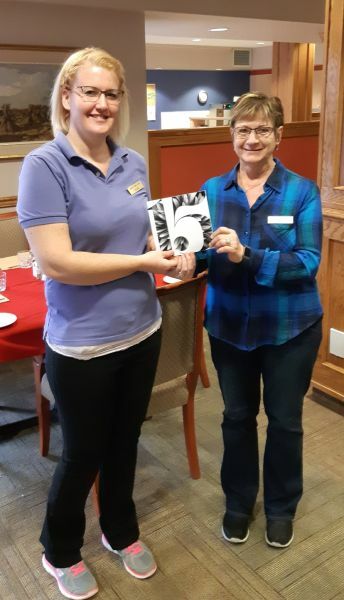 Photo: As residents look on from the dining room of PWL Athens Creek in Penticton, Ellie Betrand (left) receives her 15-year OC Tanner Yearbook from General Manager Donna McBeth.